Mistakenly, I was excited about making my first cooler freshman year. What innocent little 18-year-old Shannon didn't know was just how time-consuming they really are. I've gone with Emory to his formal in Charleston since freshman year! I made one for him our freshman and sophomore year, but decided that 2 was enough (I mean seriously what is any boy going to do with 4 coolers?!) so I didn't make one last year or this year. Emory didn't want me to have to worry about making another two when they take up so much time and he already had two that he liked! I went into the whole process freshman year blind, completely clueless about where to start. I am far from an artistic person, so I was really intimidated when I scrolled through Pinterest searching for ideas. After making two and helping friends make endless amounts of coolers, I have learned some useful tips and tricks that I hopefully make the whole process less scary. From my experience it's so much more convenient to have a cooler on wheels. The coolers that don't have handles may have better painting space, but when it's filled with ice and drinks no one wants to have to treck it from the car to the beach. My research mostly consisted of searching through Pinterest. I suggest making a secret board that you can pin any coolers/ graphics you see that you think you might want to incorporate in your design. Most of my ideas came from other coolers so it was helpful to see so many examples. Once I thought I had enough inspiration I planned out what I wanted on the 4 sides and top and wrote/ drew it out. I sanded my cooler with a small handheld sander just to make all the sides smooth and easier to paint. Sand each side until it's smooth and then wipe each side off with a wet paper towel or washcloth. Note: I decided not to spackle my cooler. Many girls will fill in the little logos and dips in the cooler so it's a smooth surface to paint. I decided not to and just paint over them instead (ex. you can still see the igloo logo on the side of the top cooler of the picture). Sharpies are your best friend. For almost all the small details, outlines, and text I used Sharpie. It so much easier to use than paint and it make the designs sharp and clean. I found that it also applies really well over the acrylic paint! Instead of using tracing paper I would frequently cut the picture or shape I wanted out, cut it out, and then traced it onto the cooler with pencil. I did use tracing paper in a few situations but I found that cutting the shape out was easier. I decided not to paint the whole sides of the coolers and instead used the white strip that goes around the cooler to write a fun song lyric. It was less painting, wrapped all the way around the cooler, and added a little personal touch! To avoid an ugly line where your two side meet on both coolers I painted different things between the sides so you coudln't see the seam. On one cooler I did golf balls and bow ties and on my other I used whales! Before I used the spray sealant, I mod podged the whole thing with a huge paint brush. I did this for my second cooler and it held up so much better than the first one I made when I just used the spray sealant. Make sure you let the spray dry for at least 12 hours to make sure it's 100% dry. I applied multiple layers of sealant until my can was empty to protect the project ! I've seen girls make master pieces, not seal them, and they get destroyed in one weekend. I must also add as a disclaimer, that I have some very creative friends that helped contribute when I got frustrated! So thankful they turned out so great!! Emory's reaction when he saw this cooler! Love this! 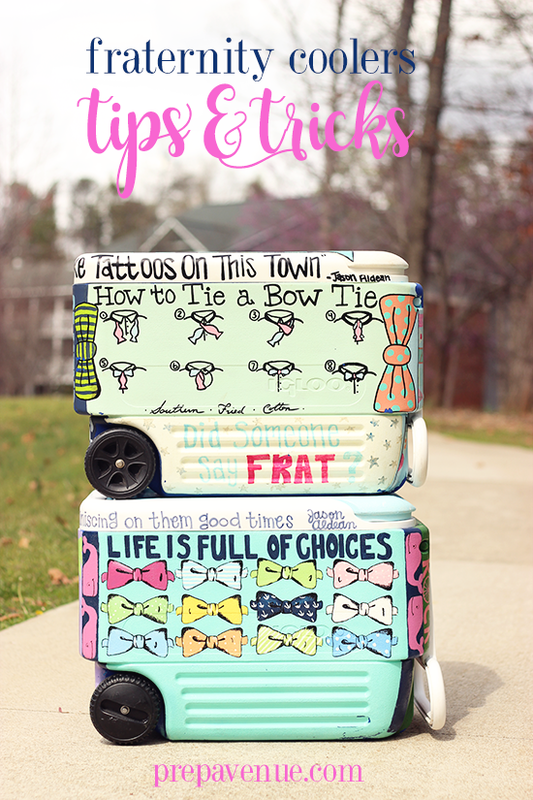 Both of your coolers are so cute and I'm sure these tips will come in handy for college next year!